The 2015 earthquake caused widespread damage, going far beyond the destruction of houses, buildings and other infrastructure. People who were hit the hardest belonged to marginalized and vulnerable groups, including the poor, the disabled, women, Dalits, children and the landless. The Post Disaster Needs Assessment (PDNA) report has identified that the quake increased the vulnerability of these groups and that nearly a million people may have fallen below the poverty line. We all need to accept that despite good efforts, reconstruction has been delayed due to multiple reasons. The first phase of the local level election is finally over. After the second phase, we will have nearly 6,000 elected women representatives, including about 2,500 Dalit women in 293 earthquake-affected local units in 31 districts. Each five-member ward committee will have two women representatives, including one Dalit woman. This will provide the NRA with new opportunities to include women and people from marginalized communities in the reconstruction process. The NRA has said that now is the right time for social reconstruction. To expedite rebuilding in the 14 hardest-hit districts, the authority has introduced new policies to include women and Dalits in district level committees on reconstruction. The authority has made it mandatory for all public buildings to be disabled friendly. It is going to work closely with the local leaders to make sure that everyone is included in our quest to complete reconstruction quickly. To ensure better communication with quake-survivors from different communities, the NRA’s radio jingles have been translated into Tamang, Gurung and Newari languages. The newly-elected women leaders and representatives from marginalized communities can be an inspiration to many women and marginalized quake-survivors. Locally elected women representatives can encourage more women to get mason training and help in the reconstruction of their houses and neighborhoods. These elected women would be looked upon as those who belong to the locality and who can identify with local issues. The authority is working to involve local leaders in social and livelihood programs to make our society more inclusive by according due priority to marginalized communities. It has taken a series of proactive measures to assist women and people from poor and marginalized communities. For example, in coordination with various partners, the NRA has been conducting mason training programs, in which women and Dalits are encouraged to participate. As masonry is a traditionally male-dominated field, this training program can very well break gendered stereotypes and build women’s capacity and recognize their contribution in the country’s reconstruction. At a time when so many men from our villages are working abroad, women’s role in reconstruction is crucial. 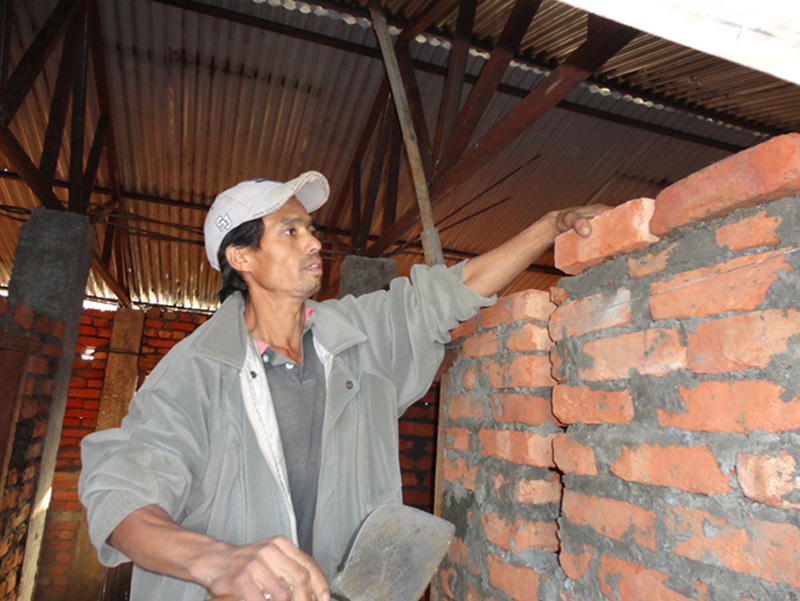 As many as 485 women in Gorkha, 99 in Okhaldhunga and 59 in Rasuwa have received mason training. 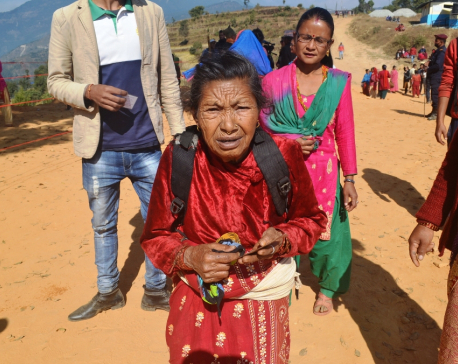 Similarly, 57 percent women involved in reconstruction are above the age of 34, 61.5 percent are Janajati and 10.3 percent are Dalit women from Dolakha, Dhading, Nuwakot and Kathmandu. Mason training has not only enabled women to challenge traditional gender roles, but also helped them earn better by equipping them with marketable skills. On a typical day, a mason makes Rs 700. The NRA has started discussions with the local representatives on reconstruction difficulties in their respective regions. To ensure social inclusion, it has established GESI (Gender Equality and Social Inclusion) units for planning, implementation, monitoring and evaluation processes, integrating GESI measures into all recovery and reconstruction activities and projects. The strategy includes raising awareness, developing capacity and addressing the specific needs of women and people from vulnerable and marginalized groups. Similarly, the NRA will provide an additional Rs 200,000 per family to landless quake survivors to help them buy their own land. A majority of these landless survivors belong to marginalized communities. Similarly, households that have been identified by a geo-hazard study as falling in risky areas and that are willing to shift to another location will receive an additional Rs 200,000 to buy land in safer areas. Some of the quake survivors who are in the process of getting the reconstruction grant of Rs 300,000 will now be eligible for an additional financial support of Rs 300,000 as interest-and collateral-free loans. This provision is targeted at low-income groups and landless families. People from deprived communities will be able to apply for the loan from banks and financial institutions. Many quake survivors were facing hardship, as the government-housing grant of Rs 300,000 was inadequate to build a house. A large number of them had not begun constructing their house despite having received the first installment of housing grant. As such, the new provision is expected to help expedite private house reconstruction. Partner organizations now can support these vulnerable communities by providing the second and third tranches of grant with technical support. This will also attract our national and international partner organizations to join hands in supporting the most vulnerable communities. Likewise, vulnerable communities can also receive an additional top-up of Rs 50,000 from partner organizations. Experience suggests that people-centric initiatives promote local leadership and engagement. While rebuilding rural communities is critical, so is integrating aspects of gender equality and social inclusion into reconstruction efforts. To address this aspect of reconstruction, the NRA has made a request to stakeholders/partners to build model houses for women, differently-abled and marginalized people during on-the-job training. While there are constant challenges in reaching out to quake survivors on time and providing necessary support quickly, the progress in distribution of grants in the last few months has aroused hope of a sound reconstruction project. The proactive leadership of newly elected local leaders, especially women and Dalits, will not only help in the post-disaster reconstruction process, but also in restoring the livelihood of the most vulnerable people in the earthquake-affected areas. The NRA’s strategies, policy measures and tools will bear fruit when there are effective institutions and capable human resources to reach out to needy people. As government effort alone may not be sufficient to achieve our target on time, the NRA has made a public appeal to the civil society, private sector, individual philanthropists and members of the Nepali diaspora to join hands in building the capacity of communities, providing technical assistance and training programs and supporting vulnerable groups through a top-up on the housing aid. By joining hands with everyone and leaving no one behind, the broader goal of reconstruction—Building Back Better—will facilitate improved and resilient livelihood and trigger inclusive growth after the local election. There has never been a more appropriate time for effective and inclusive reconstruction.